Schloss, one of our Miss Mustard Seed’s Milk Paints in the European color line, is a nice taupe/gray. It can be a little brown, a little gray and sometimes almost looks like the color of worn burlap or linen. We finish schloss in a few different ways. Tricycle with antiquing wax – it makes me so happy!! 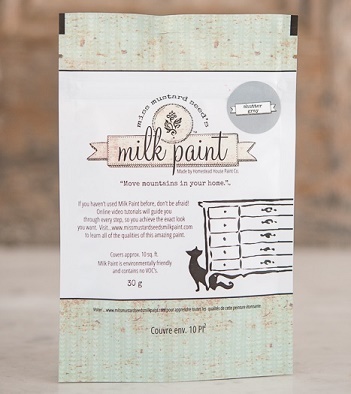 Did you know we sell all 25 colors in the Miss Mustard Seed’s Milk Paint line in small, tester sizes? The two tablespoons inside will cover approximately 10 square feet and are perfect for small projects like frames on a gallery wall, a kids size chair or a step stool. Our customers sometimes like to try out a color on the inside of a cabinet door or the back of a piece of furniture before buying the full quart size. The testers are available in store and online. This cute rustic table went straight into our nautical section at the store. It has some nice details (the shelf toward the bottom is my favorite). We used two coats of Miss Mustard Seed’s Milk Paint in French Enamel with a light coat of our antiquing wax — would be perfect for a summer cottage! We’ve been doubling down on our love a grays recently. Trophy is my favorite gray in the MMSMP line. We use it on dressers, tables and everything in between. While I like trophy with antiquing wax, it does add a bit of a brown cast and can change the color from the true gray of trophy. We mixed a custom wax, one I teach in my monthly Milk Paint 101 class, using 3/4 white wax and 1/4 antiquing wax. It gives a soft, grayer look to trophy! 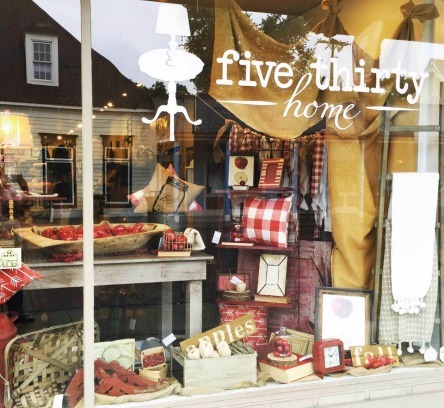 I’m so excited about our first fall window this year – when a customer tells you they almost had an accident when they saw it, I guess they are excited too! A lovely couple bought this cute piece to use as a changing table for their baby (arriving soon)! We painted it in two coats of Miss Mustard Seed’s Milk Paint in Grain Sack. I’ll give you a little hint about the baby, the drawers were painted in MMSMP arabesque on the inside! It’s not a color we use much. I debate using it all the time, but when in doubt we always choose MMSMP kitchen scale instead. What’s the difference? Flow blue is much more blue! It is more turquoise compared to kitchen scale’s rich teal tones. I think we made nice choices on these and they are available in the store now! We’ve been helping lots of customers find new treasures for their homes which means we have some great new pieces in the store! 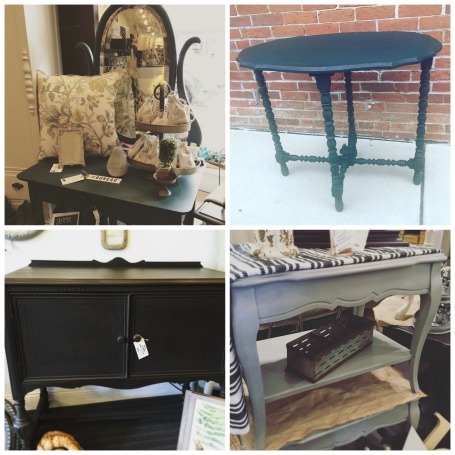 We’ve brought in vanities, sideboards and tables of all shapes, sizes and colors — stop by and check them out!! We are just back from our annual trek south for the 127 yard sale, aka the world’s longest yard sale. For those of you who aren’t familiar with the sale, it stretches from Ohio to Alabama along Route 127. Our favorite state to hit is Kentucky (it’s my home state and has the best buys)! We found a huge load of tobacco baskets, tables, oars and more! Give us a week or so and then stop in and check out our finds. Click here to see a brief video from our trip. I always picture Shutter Gray and Trophy as an either/or situation. We often help our customers choose between the two. If you’re looking for a hint of blue in the gray, go for Shutter Gray. If you’d like a little more pewter with green undertones, choose Trophy. It was nice to work together on this one…Shutter Gray on the outside and Trophy on the inside! We once had a caned headboard that customers loved so much. I was on the phone with one customer while another was in the store and both really liked it. So, any time I find one, I try to snap it up. We have been using Miss Mustard Seed’s Milk Paint in Trophy on several pieces in the last 2-3 months and I’ve gained a new appreciation for this beautiful, rich pewter gray. Grays are hard. There are so many of them (in the MMSMP line alone!). Trophy is a nice contrast to some of the lighter grays popular right now for walls and textiles. We’ve noticed two trends with pieces painted in Trophy purchased by our customers: turning a small chest into a bathroom cabinet and using a longer chest/dresser as a changing table. So fun!! We had a set of 6 of these chairs and these are the last two! I thought I would share quickly how easy it is to update an outdated dining chair to use with a desk. We painted each of these and updated the fabric.